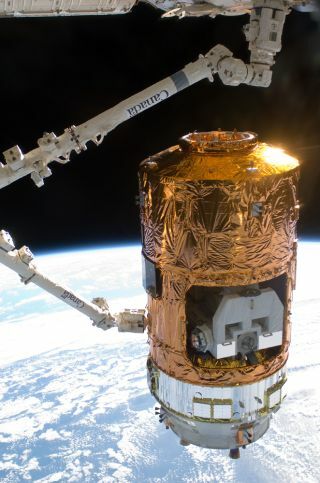 The International Space Station's Canadarm2 grapples the unpiloted Japanese Kounotori2 H-II Transfer Vehicle (HTV2) as it approaches the station, Jan. 27, 2011. Japan is set to launch a new unmanned cargo spaceship to deliver goods to the International Space Station today (July 20). The robotic spacecraft, called H-2 Transfer Vehicle-3 (HTV-3), is the third of its kind to travel to the orbiting laboratory, where six astronauts from three countries are currently living and working. HTV-3 is due to lift off at 10:06 p.m. EDT (0206 GMT Saturday, or 11:06 a.m. Japan time Saturday) from the Tanegashima Space Center in southern Japan. The spacecraft will fly atop a Japanese H-2B rocket. It is the second launch toward the space station in a week. A Soyuz space capsule launched on late Saturday (July 15) to ferry three members of the space station's crew to the orbiting lab. When the vehicle is about 40 feet away with the station, astronauts Joe Acaba of NASA and Aki Hoshide of JAXA (the Japanese Aerospace Exploration Agency) will attach it to the structure's Earth-facing docking port on the Harmony node. The maneuver is scheduled for around 7 a.m. EDT July 27. Weighing 16.5 tons (15,000 kilograms) itself, Kounotori 3 is carrying 4 tons (3,600 kg) of supplies and experiment hardware. Included in this load are the winning science experiments designed by teen students in the YouTube Space Lab competition. The competition allowed students between the ages of 14 and 18 to design experiments and describe them in films posted to the video sharing site. More than 150,000 YouTube users worldwide voted on the entrants, and two winning projects were chosen. HTV-3 will also carry the new ISERV camera system (International Space Station SERVIR Environmental Research and Visualization System), designed to observe Earth via remote control. Researchers will be able to direct the camera to observe specific sites on the globe to analyze disasters and study the planet's environment. The system is due to be installed in the station's Destiny laboratory after its arrival. "ISERV came about because officials in developing countries are sometimes unable to acquire the images they need to address environmental threats and provide post-disaster assessments," said Nancy Searby, capacity building program manager for the SERVIR program at NASA Headquarters in Washington, in a statement. "The SERVIR team approached NASA's ISS and Earth Science Applied Sciences Program with the concept of acquiring the needed imagery from the ISS. The ISERV test bed payload is a result of that collaboration." HTV-3 will follow its predecessors, HTV-1 and HTV-2, which launched in September 2009 and January 2011, respectively. The vehicles are among a fleet of robotic spacecraft that deliver food, supplies and science equipment to the station that includes the Automated Transfer Vehicles (ATVs) from Europe and the Progress cargo ships from Russia. In the wake of the space shuttle retirement last year, NASA has encouraged the development of private U.S. supply ships to join this fleet. The first of this type, SpaceX's Dragon spacecraft, made its maiden flight to the station in May of this year.